In our previous blog post we saw how to Create a Cloud Provider for vCAC in vCloud Application Director. We need to build a template on vSphere to use it for provisioning with vCAC and also with App Director. We must install the Application Director bootstrap agent on the VM. In this example, we will see how to to add the Application Director agent on a already created VM with Windows 2008 R2 and then prepare it for use with clone vCAC vSphere blueprint, which can also be used for Application Director deployment. Make sure there is no vCAC guest agent installed on this template, if it has been installed you will have to manually uninstall the guest agent,stop the service and then run sc delete VCACGuestAgentService. The Application Director agent bootstrap install will configure the vCAC agent as part of the installation process. 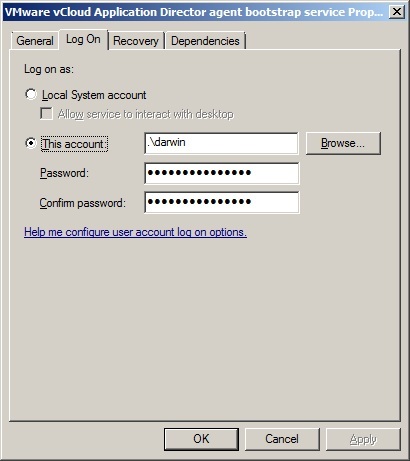 Log in to the vSphere client and open a Windows virtual machine. Type the Windows Administrator credentials and open a command prompt. Download and install the supported Java SE 7 Runtime Environment from http://Application_Director_IP/agent/jre-1.7.0_45-win64.zip. Create a \opt\vmware-jre folder and unzip the JRE file to the folder. Open a PowerShell command window and type type \opt\vmware-jre\bin\java -version to verify the installation. The installed version of Java appears. To install the vCloud Automation Center 6.0 guest agent. a Change directory to C:\. b Download the vCAC-vCAC_Version-Installation ZIP file from the VMware product download site. c Unzip the installation file to C:\ and open the VRMGuestAgent folder. Download the vCloud Application Director agent bootstrap file from http://Application_Director_IP/agent/vmware-appdirector-agent-bootstrap-windows_VersionNumber.zip. In our case it would be http://192.168.10.173/agent/vmware-appdirector-agent-bootstrap-windows_6.0.0.0.zip. 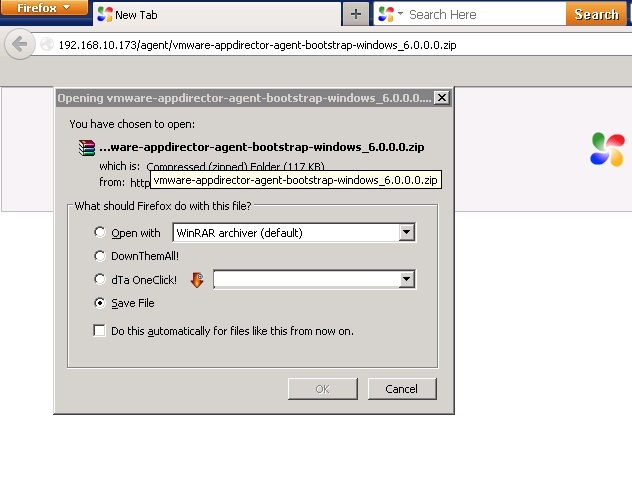 Unzip the vmware-appdirector-agent-bootstrap-windows_6.0.0.0.zip file to the \temp folder. 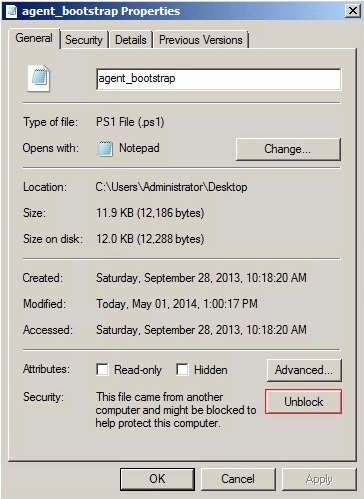 Right-click to view the \tmp\vmware-appdirector-agent-bootstrap-windows_6.0.0.0\agent_bootstrap.ps1 file properties and click Unblock to disable the security on the file. There are two ways in which the user for running the service can be created. if you download the ntrights.exe script, the install.bat filw will assign darwin user as service account. You can download the file from here. If the NTRights.exe utility is not available, manually configure the agent bootstrap service to run in a specific user account after you run the install.bat script. Now we will see the actual steps involved in installing the agent. Open a Windows CMD console and navigate to the \temp folder. Type the command to install the agent bootstrap. The install.bat script creates a user account called darwin for the agent bootstrap service and uses the password you set. The Password must meet the Windows password requirements. Check the \opt\vmware-appdirector\agent-bootstrap\agent_reset.bat file output log to verify that the user darwin_user is created. Now Shut down the Windows virtual machine and convert it into a template. Once done, Create a blueprint in vCAC for the same windows machine so we can leverage this template to deploy applications using vCAD. PaaS with vCloud – Part 8 : Map the vCloud Automation Center cloud template to the vCloud Application Director logical template.